Before the arrival of European colonists, African boundaries were very loosely defined. Borders reflected the territories inhabited and controlled by different ethnic groups, and they often changed over time—generally as a result of migration or conquest. Moreover, these boundaries did not define all the available space in Africa. Some areas remained unclaimed or served as neutral zones between indigenous ethnic groups. European nations began to redraw African territorial lines in the late 1800s, when their interest turned from establishing coastal trading posts to developing the continent’s rich inland resources. By the 1880s European explorers such as Sir Richard BURTON, David LIVINGSTONE, Henry Morton STANLEY, and John Speke were staking national claims to larger and larger portions of African territory. Many explorers arranged treaties with African chiefs, claiming the land for European rulers. Although much of Africa remained unknown and unexplored, European competition for territory increased with the desire to gain control of mineral resources and other riches from the African interior. 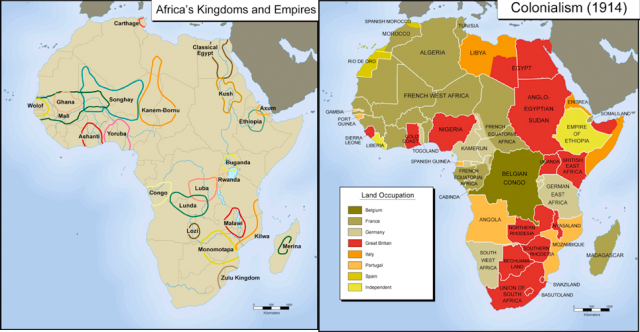 During this “Scramble for Africa,” European countries tried to aquire as much territory as possible. The amount of territory that each nation actually colonized depended largely on its power in Europe. Britain, France, Germany, and Italy, which were strong and rising European forces, ultimately controlled more land in Africa than weaker countries such as Spain and Portugal. As a result of the “Scramble,” the map of Africa changed from a collection of loosely defined ethnic territories into a series of fixed colonial states. European colonists set boundaries according to their territorial claims, with no regard for the traditional borders of indigenous peoples. In some cases, these new territorial lines divided ethnic groups between different colonial powers. In other cases, they placed groups with a history of hostility toward each other together in one colony. The Europeans set boundaries by geography—or sometimes merely by drawing a straight line on a map. Natural features, particularly rivers and lakes, often became the borders of European colonies. For the most part such lines remained fixed, except when they were redrawn as a result of the changing fortunes of the colonial powers. For example, Germany lost its African territories after suffering defeat in World War I, and these territories were incorporated into the colonies of other nations. African nations began to gain their independence in the 1950s, but the colonial boundaries remained basically unchanged. At first some African leaders called for creating a type of United States of Africa, with relatively open borders between nations. That idea never took hold. In some regions, border disputes—such as that between SOMALIA and ETHIOPIA—have contributed to ongoing or recurring conflicts.